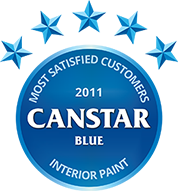 Compare interior paint using our customer satisfaction ratings. Solver took out the award for Most Satisfied in terms of overall customer satisfaction, scoring strongly for price, ease of application and quality finish. Australians are emulating the ‘do-it-yourself’ style adopted by shows like The Renovators and are taking on their own home painting projects. Our survey of interior house paint customers found that seven in every ten respondents were more likely to get their hands dirty with the job of house painting than passing the brush to someone else. Males were 13% more likely than females to have undertaken home painting duties. With Aussies taking such a hands-on approach to maintaining their homes, how have they rated top paint brands? Australian brand Solver Paints has performed particularly well, and has received our most satisfied customers award for interior paint. We rated Solver Paints alongside leading brands Wattyl, Dulux, Taubmans and British Paints. For any painters taking on the entire house, Solver Paints also received our award for exterior paint. Taubmans stood out as a noteworthy brand in this survey with five stars for ease of application, durability, range, and quality of finish. Wattyl and Dulux also excelled with their own five star ratings. Our results have also revealed that more than two thirds of respondents purchased low chemical paint to avoid health risks. These eco-friendly paints are better for the environment, and are particularly beneficial to those with allergies or chemical sensitivities. Solver Paints were streaks ahead of other rated brands with five stars for overall satisfaction, while Wattyl, Dulux and Taubmans all received four stars for this criteria. British Paints received three stars for overall satisfaction. Another five stars went to Solver Paints, this time for price, while Wattyl and British Paints received four stars for theirs. Dulux and Taubmans both received three stars. Wattyl were awarded five stars for their coverage, while Solver Paints, Taubmans and Dulux received four stars. British Paints received three stars for this criteria. Five stars each were awarded to Taubmans, Wattyl and Solver Paints for the ease of application. Dulux was not far behind with four stars, and British Paints received three. Another tie for five stars occurred between Dulux and Taubmans for the durability of their products. Solver Paints and Wattyl received four stars each while British Paints received three stars for their durability. Solver Paints, Dulux and Taubmans all come out on top with five stars each for their variety of paints and paint colours. Wattyl followed with four stars while British Paints received three. Another three way tie for the five star spot means it’s difficult to choose a product that won’t look great when it dries. Solver Paints, Wattyl and Taubmans all received five stars while Dulux received four stars. British Paints was not far behind with three stars. Canstar Blue commissions Colmar Brunton to regularly survey 2,500 Australian consumers across a range of categories to measure and track customer satisfaction. The outcomes reported are the results from customers within the survey group who have purchased interior house paint in the last three years – in this case, 762 people.